Children enjoy their summer vacations away from the rigors of school work, and their summers are all the more memorable when they include family vacation trips. Since my family lived in Upstate New York, which is mostly forested wilderness, we did what most others in our area did on summer vacation. We went camping, often in state parks near lakes that offered very cold swimming water, but sometimes we were just among the trees with only a campfire for warmth and a kerosene lantern for light. What was most memorable to me about trips to areas around Speculator, New York, were the flies, particularly the black flies that feed on animal and human blood. Trucks there often roamed the roadways emitting vast clouds of pesticide spray to combat this pest. Since this was the late 1950s and early 1960s, the spray was likely DDT, which is easier to say and write than the chemical name, Dichlorodiphenyltrichloroethane. The structure of DDT reminds me of a clown in balloon pants, but its toxic effects are not as laughable. DDT was used extensively as a pesticide in the 1950s and 1960s, but it was banned for most uses in the United States in 1972. When I was in elementary school, my parents bought me a biology themed "coffee table book" that contained many spectacular color photos of plant and animal species. These were selected for their color, rather than their scientific importance, and one image I especially liked was that of the mushroom species, Amanita muscaria, commonly known as fly agaric. In that book, there was no explanation of its fly-related name. Albertus Magnus, one of the few dozen Doctors of the Church, described the fly agaric in his De vegetabilibus, and explained its name. ...vocatur fungus muscarum, eo quod in lacte pulverizatus interficit muscas. ...it is called the fly mushroom because it is powdered in milk to kill flies. The fly agaric is toxic, so it poisons flies that feed on this milk mixture. Albertus Magnus, who described this species and its use as a pesticide for flies, is mistakenly thought to have been an Alchemist. This is because later alchemical books were falsely published under his name to add authenticity. One other interesting item associated with flies is Shoofly pie, a molasses crumb cake that's baked in a pie crust. The origin of the pie's name seems to arise from the idea that the sweet molasses would attract flies while the pie was cooling, usually on the sill of an open window in the 19th century. We should thank technology for our air conditioned kitchens that prevent such taint. The real topic of this article is fly ash, the very fine ash that flies up the chimney when coal is burned. Today, there are precautions to filter fly ash from the combustion gases so that it doesn't pollute the atmosphere. A side-effect of this process is a vast accumulation of fly ash, and scientists are doing research to determine beneficial uses of this material. In an earlier article (Rare Earth Metals from Fly Ash, July 7, 2016), I described how rare earth metals can be extracted from fly ash. While coal has steeply declined as an energy source in the United States, there's still a lot of it being burned to produce a lot of fly ash (see table and figure). U.S. primary energy production history. Data from the US Energy Information Administration Website. Global demand for coal fell by 1.9% from 2015-2016 to 5,357 metric tons carbon equivalent, as other energy sources took the lead. Coal demand has dropped by 4.2% since 2014, but the drop is from a very high level. The US still generates about a third of its electricity from coal, producing more than 100 million tons of solid combustion products annually, of which nearly 50 million tons are fly ash. Fly ash contains mostly silicon dioxide (SiO2), aluminum oxide (Al2O3) iron oxide (Fe2O3), calcium oxide (CaO), and some trace metal oxides. So, what can be done with such a mixture of compounds? That's was the problem addressed in recent research by Rouzbeh Shahsavari, an assistant professor of Materials Science and Nanoengineering at Rice University and his graduate student, Sung Hoon Hwang. They were able to engineer a Portland cement substitute using a modified fly ash composition. [5-6] This fly ash binder for concrete does not require the high-temperature processing of Portland cement, so it's environmentally friendly. This binder has the same compressive strength as Portland cement after seven days of curing. The manufacture of concrete is energy-intensive, and it's responsible for about 5-10% of global carbon dioxide emission. In fact, the carbon dioxide emissions from the 20 billion tons of concrete produced annually are surpassed only by those from transportation and energy. About 5-10% silicon- and aluminum-rich fly ash are added to the Portland cement in concrete to mitigate such an environmental affect, but there's still a lot of room for improvement. Previous attempts to replace Portland cement with fly ash would only work when a large amount sodium-based activator compounds were used, and these made the replacement material more expensive than cement. The researchers used Taguchi analysis, better known in industrial circles as Design of experiments (DOE), to reduce the number of experiments and to computationally a href="https://en.wikipedia.org/wiki/Optimization_problem">optimize a composition. The result was a composition with minimal sodium addition and a 7-day compressive strength of 16.18 MPa, a value comparable to that of conventional Portland cement. Design of experiments results for the effects of the amount of nanosilica and the Ca/Na molar ratio on the early-age compressive strengths of the fly ash replacement for Portland cement. The optimum composition has a nanosilica content of 5 wt-%, and a ratio of Ca/Na = 5.79. "A majority of past works focused on so-called type F fly ash, which is derived from burning anthracite or bituminous coals in power plants and has low calcium content, but globally, there are significant sources of lower grade coal such as lignite or sub-bituminous coals. Burning them results in high-calcium, or type C, fly ash, which has been more difficult to activate... Our work provides a viable path for efficient and cost-effective activation of this type of high-calcium fly ash..."
material properties of shrinkage, durability, and long-term behavior still need to be assessed. Sources for starting material can extend beyond coal-fired power plants to other industrial waste, such as blast furnace slag and rice hulls. 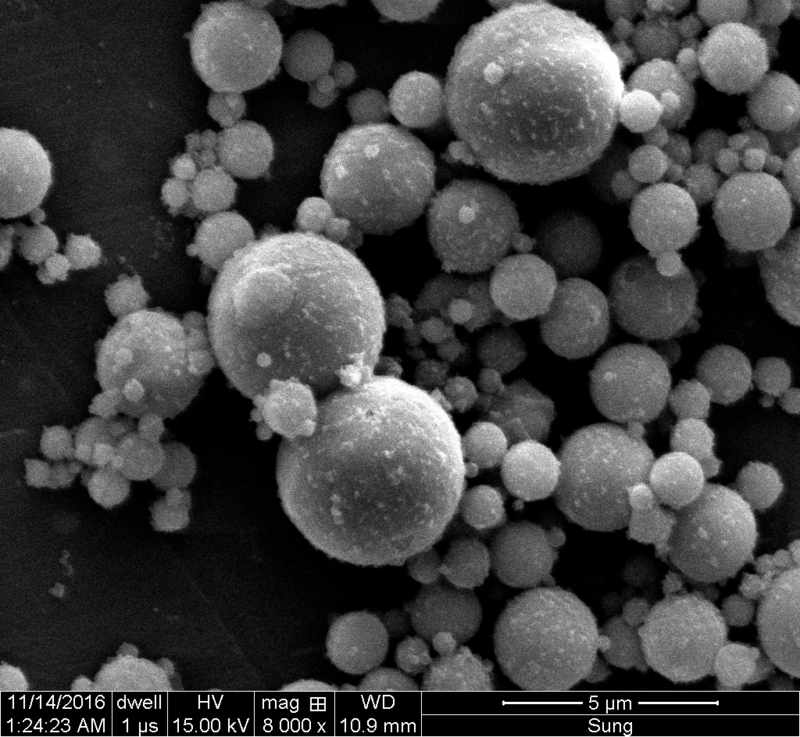 Left image, a scanning electron micrograph of raw, type C fly ash particles. These consist mostly of calcium oxide, and they are a byproduct of coal-fired power plants. 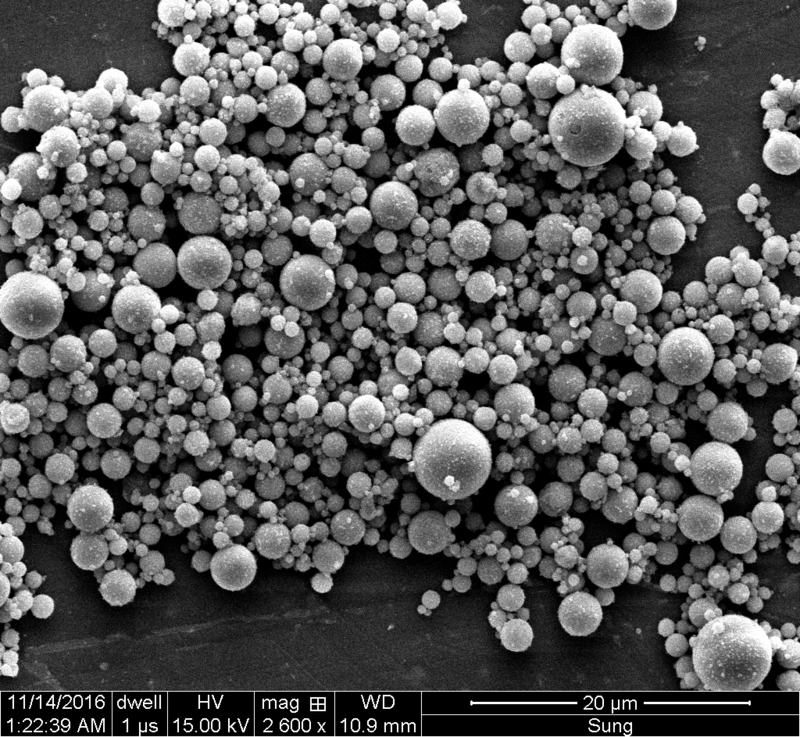 Right image, a magnified view of these particles. (Images: Multiscale Materials Laboratory/Rice University). Albertus Magnus, "De vegetabilibus," Carolus Jessen, Editor, (Berlin, 1867), PDF File of Latin Text, available at the Albertus Magnus Website of the University of Waterloo. U.S. primary energy production in 2017, US Energy Information Administration Website. Coal 2017, International Energy Agency Web Site. Ross K. Taggart, James C. Hower, Gary S. Dwyer, and Heileen Hsu-Kim, "Trends in the Rare Earth Element Content of U.S.-Based Coal Combustion Fly Ashes," Environ. Sci. Technol., vol. 50, no. 11 (June 7, 2016), pp. pp 5919-5926, DOI: 10.1021/acs.est.6b00085. This is an open-access publication with a PDF file here. Sung Hoon Hwang and Rouzbeh Shahsavari, "High calcium cementless fly ash binder with low environmental footprint: Optimum Taguchi design," J. Amer. Ceram. Soc., Accepted Online Manuscript, June 13, 2018, https://doi.org/10.1111/jace.15873. Mike Williams, "Cementless fly ash binder makes concrete 'green'," Rice University Press Release, June 18, 2018. Linked Keywords: Child; children; summer vacation; school; family; Upstate New York; forest; forested; wilderness; camp; camping; New York state parks; lake; swimming; tree; campfire; kerosene lamp; kerosene lantern; Speculator, New York; fly; flies; black fly; black flies; eat; feed; animal; human; blood; truck; road; roadway; pesticide; pesticide application; spray; pest (organism); 1950s; 1960s; DDT; chemistry; chemical; molecular structure; clown; balloon; trousers; pants; toxicity; toxic; laugh; laughable; ban (law); banned; United States; dichlorodiphenyltrichloroethane; Wikimedia Commons; Leyo; elementary school; parent; biology; >coffee table book; color photography; color photo; plant; animal; species; color; science; scientific; mushroom; Amanita muscaria; Pterygota; Albertus Magnus; Doctor of the Church; De vegetabilibus; milk; poison; alchemist; alchemy; alchemical; scientific literature; publish; Onderwijsgek; Shoofly pie; molasses; streuselkuchen; crumb cake; baking; bake; pie crust; sweet; window sill; window; 19th century; technology; air conditioning; air conditioned; kitchen; taint; fly ash; chimney; coal; combustion; burn; filtration; filter; gas; atmosphere; scientist; material; rare earth element; rare earth metal; energy; United States; natural gas; petroleum; renewable energy; nuclear power; U.S. primary energy production history; US Energy Information Administration; metric ton; equivalent carbon content; carbon equivalent; electricity; solid; silicon dioxide (SiO2); aluminum oxide (Al2O3); iron oxide (Fe2O3); calcium oxide (CaO); trace metal oxide; research; Rouzbeh Shahsavari; assistant professor; Materials Science and Nanoengineering at Rice University; postgraduate education; graduate student; Sung Hoon Hwang; Portland cement; concrete; environmentally friendly; compressive strength; concrete curing; carbon dioxide; greenhouse gas; emission; transport; transportation; silicon; aluminum; sodium; sintering; activator; chemical compound; Taguchi methods; Taguchi analysis; industry; industrial; Design of experiments (DOE); experiment; computation; computational; pascal (unit); MPa; nanosilica; calcium; Ca; sodium; Na; mole (unit); molar; ratio; Inkscape; portlandite; anthracite; bituminous coal; lignite; material properties; shrinkage of concrete; durability; fossil-fuel power station; coal-fired power plant; industrial waste; blast furnace; slag; rice hulls; scanning electron microscope; micrograph; byproduct.